But Brandon Scott, chair of the city council public safety committee, still had questions. “First thing to ask is, why is he the best man for Baltimore?” asked Scott. Scott says Fitzgerald has to do more than implement reforms required by the federal consent decree. Fitzgerald grew up in Philadelphia, got a Bachelor’s degree from Villanova University and Master’s and Doctorate degrees in Business Administration from Eastern University. He began his law enforcement career with the Philadelphia police department. 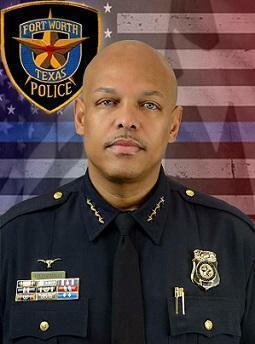 He became chief of police in Missouri City, Texas, in 2009, moved to Allentown, Pennsylvania, in 2013 and took the Fort Worth job in 2015. He was seen as a reformer in those departments. In Allentown, the local paper, the Morning Call, reported that Fitzgerald whittled the department’s overtime costs from $2 million in 2014 to $1 million in 2015. But he came under sharp criticism from the Fort Worth Police Officers' Association as well as community residents for his responses to multiple incidents. “There has been no one in this community that has said, ‘wow, we’re going to miss him,’” said Pastor Michael Bell from The Greater St. Stephens First Church in Fort Worth. Bell was on the search committee that appointed Fitzgerald chief in 2015. Bell was also one of the first in Fort Worth to call for Fitzgerald’s resignation. In one, he fired an officer involved in a shooting, even though charges against the officer had been dropped. In another, a white officer tackled and arrested a black woman who called police because a white neighbor had allegedly assaulted and choked her seven-year-old son, but did nothing to the man who allegedly attacked the child. Fitzgerald suspended the officer, who is still on the force, for 10 days without pay. Fitzgerald also demoted two senior officers accused of leaking body camera footage of the incident. “During that time we learned that Joel Fitzgerald was not good at crisis management,” said Bell. He urged Baltimore city leaders and community residents to question Fitzgerald, who must be confirmed by the City Council, closely. A spokesman for the Fort Worth department said via email Friday that City Manager David Cooke has been notified that Fitzgerald is the final candidate for the Baltimore job, but that he has not submitted a formal letter of resignation. Fitzgerald failed to return several calls for comment. Scott says he plans to go to Fort Worth with Council President Young and other city council members to vet Fitzgerald and speak with community residents and leaders in early December. Lester Davis, spokesperson for Young, says the confirmation process, expected to begin in January, will be more robust than previous appointments with multiple committee hearings to allow more time for public comment. If confirmed by the city council, Fitzgerald would be Baltimore’s fourth police commissioner since 2015.